Why You Need A Secret Messenger? If you want to send a message to your dear ones secretly, you definitely need this secret messenger. 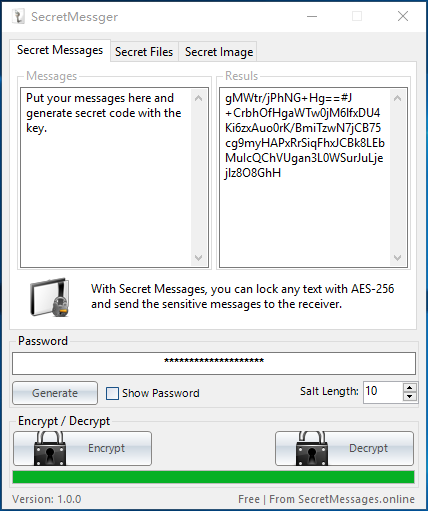 Read details about Secret Messenger: Free AES-256 Encryption Tool. Data encryption has become very essential when it comes to enhancing the security of the message being sent. It ensures that information reaches the intended recipient without undergoing any manipulation. Data manipulation is very possible especially when data lands in unauthorized hands. It is therefore important to be very careful whenever you are sending any information or messages. Read: How to Recover data from hard disk. In this era which is full of hackers, vital information is likely to fall into the hands of unauthorized personnel. It is very rewarding when you make good use of data encryption tools. This new trend has made it possible to preserve the confidentiality of messages and information being sent around. In fact, there are lots of software you can make good use of when it comes to data encryption. One of them being Secret Messages, equipped with a Free AES 256 encryption tool. There are many reasons why people have switched to data encryption. One of the main reasons is to secure one’s data. This is possible through using Secret Messager, which has a free AES-256 encryption tool. With this software you will be able to hide messages, making them only available to the authorized recipient. Your information will have enhanced security; besides it will be placed far from the reach of people with self-interests. Data encryption is mainly associated with enhancing the security of the message being sent. This is where the secret messages software comes in handy. It has the AES 256 technology that ensures data is only shared between the sender and receiver alone. No third party is allowed to access the information. This software works at an increased rate. In fact, that is why it has become more popular among individuals who send sensitive information and want it to reach the intended destination at a faster rate. With this software, it is impossible to restore the sent messages. Your sensitive information will be kept safe. Using this software is 100% free. You will enjoy sending your data faster and securely without having to dip into your pocket. First, the information you are sending will be encrypted. This software will also generate data decryption codes that you will share with the recipient for easier reading of the encrypted messages. Read How to Find the Folder Disappeared From Hard Drive. When sending sensitive data, you will require a very secure source. This is possible by using the Secret Messager software. The process will be undertaken offline. There are no possibilities for uploading any files or messages. As a result, your information will be kept safe. The software uses the AES256 technology in encrypting files and messages. The messages can be encrypted in form of images that cannot be understood by anyone else apart from the intended recipient. The recipient will need to have a secure secret key in order to decrypt the message received. This prevents the information from being accessed by any prohibited person. Encrypt/Decrypt messages. Support more than 100 languages. Encrypt/Decrypt files. It can encrypt or decrypt 100 files at one time. Hide messages in an image and no one can read it unless you have the key. Generate a random secret key. Data will never be uploaded to the cloud. Encrypting your messages is one of the best ways of keeping your information safe. In that connection, you will require a reliable encrypting software to ensure your messages are kept safe. Here is where the Secret Messager comes in handy. It has all the features required in keeping your messages safe and secure. One of the best messenger keeping in mind security.